Philippe Coutinho's attempts to pay off his £142 million pricetag got underway on Thursday night, when the midfielder scored his first goal for Barcelona to secure his new side a place in the Copa del Rey final. Coutinho opened the scoring as Barca saw off Valencia by an aggregate score of 3-0, setting up a clash with Sevilla for the trophy. Having hit the crossbar at the weekend, Coutinho finally found the net for his new side this week at the Estadio Mestalla and there was an air of inevitability about the manner in which the 25-year-old opened his account. 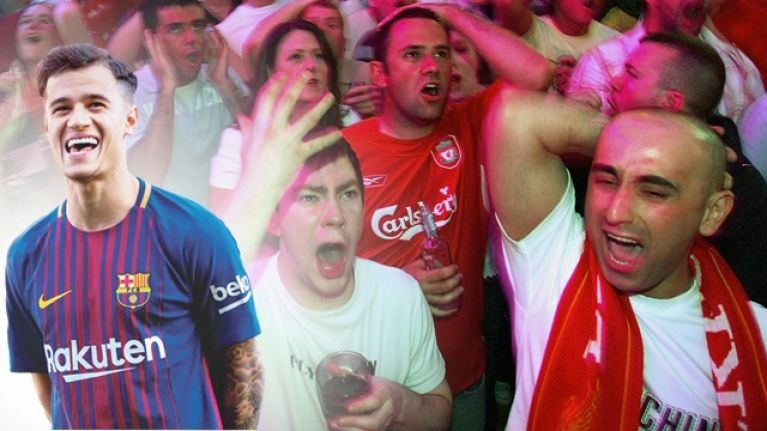 Liverpool supporters might be advised to look away now as Coutinho's first goal for the Catalan club arrived courtesy of another Reds fan favourite. Luis Suarez, arguably the greatest forward in Liverpool's history, selflessly set up Coutinho, one of the most talented players ever to grace the Anfield turf, and it came via a free-flowing move reminiscent of the 2013/14 Premier League season in which the Reds came within a whisker of claiming the title. Suarez turned the Valencia defence inside out before getting his head up and spotting the run of Coutinho into the box. The Uruguay international made no mistake as he dropped the ball perfectly on to the foot of the onrushing Coutinho and you already know how the goal went down on Merseyside. Suarez setting up Coutinho for his first Barcelona goal. Coutinho goal. Suarez assist. Barcelona 1-0. I hate football.